When the boy asked me what I wanted for my 40th birthday (40 - eek!) I really couldn’t think of anything I needed, so I thought it would be nice if we went away somewhere instead. We’ve been saving all our money for house renovations for so long now and we haven’t been able to go on holiday nearly enough, although that’s definitely going to change this year! Getting me on a plane is always tough, as I’m terrified of flying (my aircraft engineer brother does not help this by telling me that they fix the aeroplanes with gaffer tape) but once I’ve arrived at my destination it’s always worth the stress of travelling. Both the boy and I have been talking about going to Iceland for a short break for a while now, so I settled on Reykjavik for my birthday treat. We couldn’t actually go on my birthday, so instead picked a date near the end of January, vaguely hopeful that we might get to see the Northern Lights. We stayed at the CenterHotel Arnarhvoll, which is right by the Harpa concert hall and within easy walking distance of Reykjavik town centre. By the time we had transferred from the airport, it was around 8pm when we arrived, so for convenience we had dinner in the Sky Bar at the hotel. It was a bit overcast, but we could still see the snow covered mountains across the water. Our room was clean and functional and had a heated floor, which was brilliant! Breakfast was also served in the Sky Bar, with a variety of cereals, pastries, fruit, toast etc available. There was also a waffle making machine next to a giant bowl of waffle batter, which the boy was very excited about, as he loves waffles! 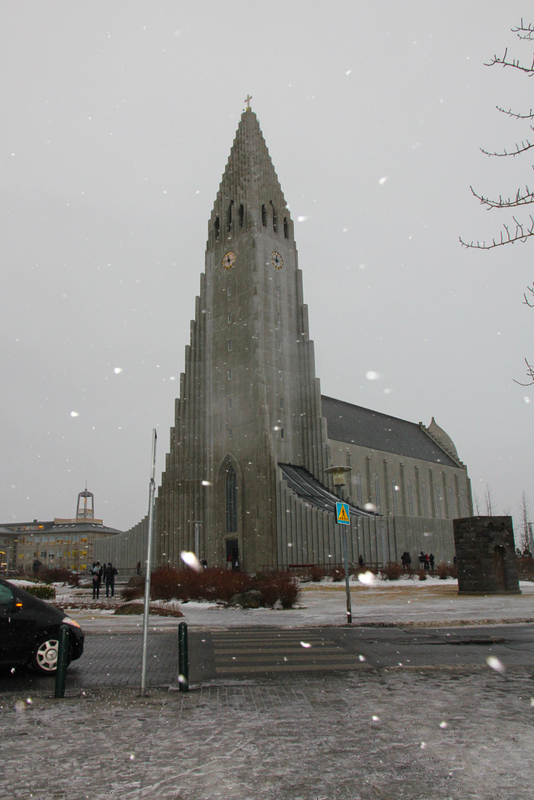 After breakfast, we headed out to explore Reykjavik. Oh my gosh, Iceland in January is cold! I did actually do some weather research before travelling and packed many layers of thermal goodness. I have previous form for being a complete idiot when it comes to this, having rocked up to meet my mother at Heathrow for a trip to New York in my early 20s wearing a floor length wool coat, boots and a jumper. It was June. What? New York always looks cold and snowy in films! We had a wander around the harbour before heading to Laugavegur, which is the main high street in Reykjavík . 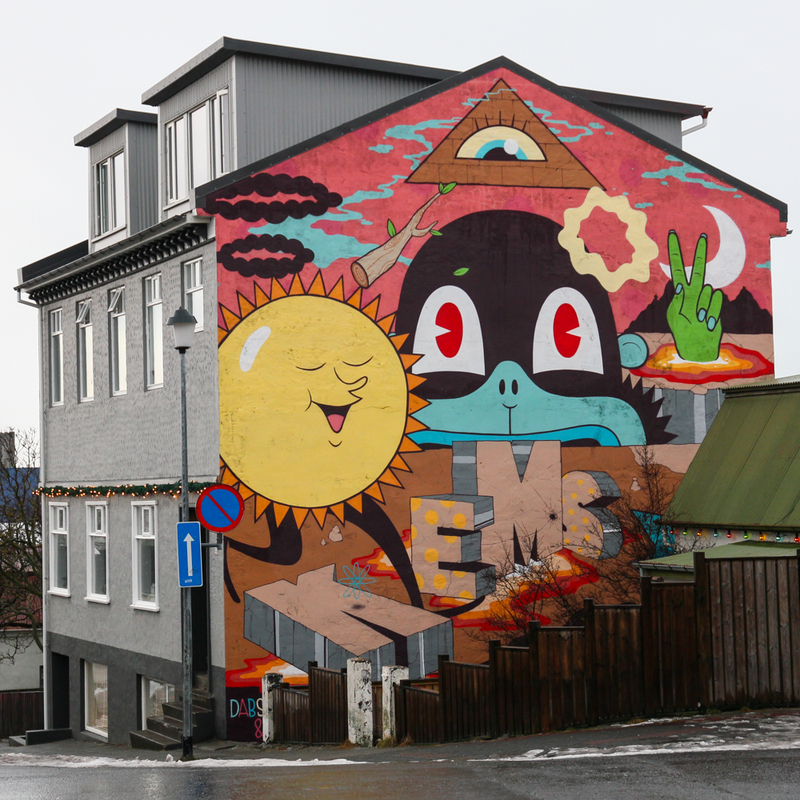 I’d read about the street art scene in Reykjavik and was keen to look at some of the murals. There is a lot of construction going on in the city, which seems to be mostly new hotels and apartment blocks. The temporary hoardings and fences on the constructions sites mean that new artwork pops up and disappears again quickly, as the city changes around it, but there are also more permanent murals to be found. After wandering around the city centre, and visiting Parliament House and the Hallgrímskirkja church (we didn’t go up to the viewing platform as it was so misty we wouldn’t have seen anything), we stopped at Bæjarins Beztu Pylsur hot dog stand for a quick lunch (Tryggvagata 1, 101 Reykjavík, Iceland). The boy gets very grumpy if not fed regularly, whereas I often forget to eat if I’m out and about. 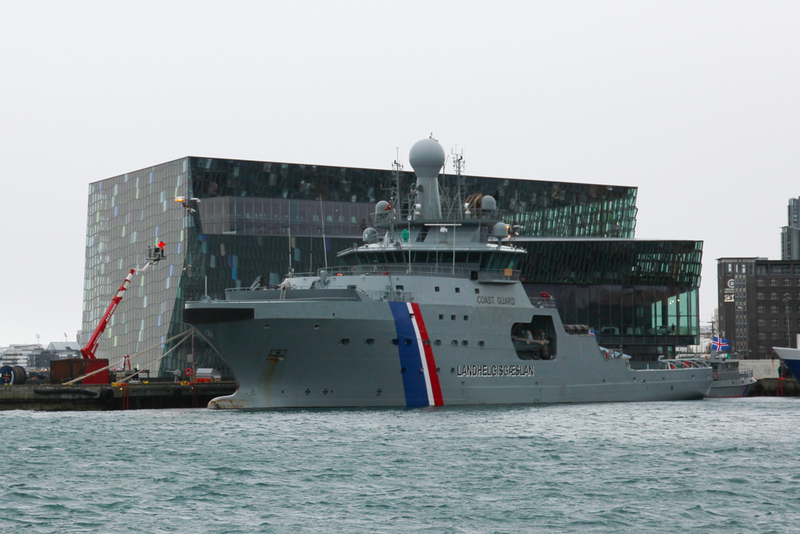 We then headed back towards the harbour to visit the Harpa Concert Hall, which is such an architecturally stunning building. We saw it all lit up the previous night when we arrived, and this time went for a wander inside, as by this point we were freezing cold! The glass panelled walls, with clear and colour coated sections, were inspired by the Icelandic landscape, shifting colour as the light catches them. Attempting a walk around the harbour in the increasingly fierce winds and driving rain was abandoned for a retreat to the hotel. After switching on the floor heating, I happily lay on the tiles for a bit, then we headed down into the spa area for a dip in the hot tub before dinner. Oh my gosh Iceland is expensive! Even in little cafes, food costs a lot of money, and restaurants for evening meals are super-pricey. I really wanted to get fish and chips, as eating fresh fish caught in the oceans surrounding Iceland sounded perfect. We’d walked past Reykjavik Fish Restaurant (Geirsgata 4a, 101 Reykjavík) earlier in the day, and it had good reviews on Google, so we decided to head back there for dinner. 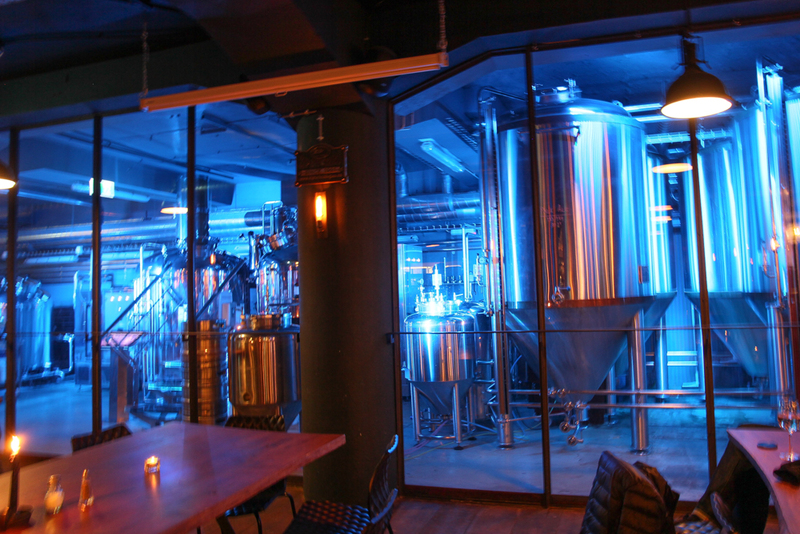 I’d also read about a micro-brewery nearby, Bryggjan Brugghus (Grandagardur 8, Reykjavik 101), which had a happy hour, so we stopped off there first for a beer. We’d made a plan to come back after dinner to a cute little ice cream parlour we’d spotted near the brewery, but the sky had started throwing down some particularly unpleasant freezing rain, so we retreated back to the lovely heated floor of our hotel room again. The next night we were heading out for a Northern Lights coach trip, so had an early dinner at a tiny burger place on the harbour, Hamborgarabulla Tomasar. It was really cosy and friendly, and seemed to be frequented by a lot of locals. The burgers were cheap (by Iceland standards!) and they did a decent veggie burger. We got to try the ice-cream place, Valdis, afterwards too, and it was delicious! Yes, I know, it’s super-touristy and really expensive, but I figured going to Iceland and not going to the Blue Lagoon would be like going to New York and thinking you’re too cool to bother going up the Empire State Building. As the boy had paid for the trip as a birthday gift to me, I treated us to the Blue Lagoon experience. You need to book in well in advance, and there are a variety of packages on offer, ranging from expensive to extortionate. I picked something in the middle, that got you entrance to the lagoon, drink at the bar, an extra algae face mask and bathrobe/slippers etc. The coach transfer from the hotel was included in our holiday package and it took about an hour to get there from the bus stop across from our hotel. The entrance to the Blue Lagoon was a bit chaotic and busy, and we had to queue for a while. There were staff members walking up and down the lines advising on hair and jewellery care (the natural chemicals in the water cause silver and white gold jewellery to darken and tarnish and play havoc with your hair). Given my job, I already know about the sensitivity of precious metals and wasn’t wearing any of my jewellery, but heeded the hair warnings given that mine is bleached to buggery anyway, and covered it with a thick layer of the provided conditioner before heading into the lagoon. The outside air temperature was freezing, but you can enter the lagoon from the inside if you’re not feeling so brave. I liked the contrast between the grumpy gloom and the lovely warmth of the geothermal water though. You can stay at the Blue Lagoon for as long as you want and I’d kind of imagined we’d spend most of the day relaxing there. But, it’s really busy, there are a lot of people and the boy was getting a bit antsy and wanted to head back to Reykjavik. Also, my fingers were getting all pruney, which always distresses me slightly, and the atmosphere in the internal parts of the lagoon is a little more corporate than relaxing. I’m really glad we went to the Blue Lagoon, as bobbing about with the boy in the gorgeous blue waters was such a lovely experience, but the three hours or so we spent there was definitely long enough. The landscape, however, was pretty awe inspiring. The miles of nothingness and black volcanic rock, with steam randomly shooting up from the ground makes you feel like you’re on another world. The boy and I have planned to return to see more of the remote areas and waterfalls. We may have to drive, although not sure I can even remember how!